An ‘evil’ mother buys a last chocolate bar for her two young children at a filling station shortly before killing them, says Russian law enforcement. 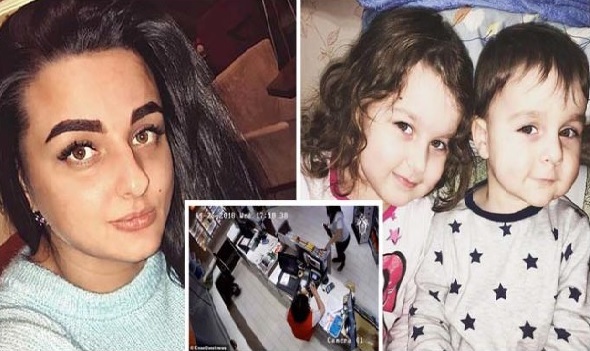 Divorcee Elena Karimova, 27, also bought lighter fuel which she used to incinerate bodies of her daughter, four years old Khadizha, and 2 years old son Suleiman, who she strangled in the back seat of her rented Kia Rio. In a video it can be seen she goes to her hired car — inside which are her two children — to fill up with fuel before returning to collect the items which she is seen carrying as she gets back into her car. After an hour she parked the car and strangled her children, it is alleged. Then she took the bodies into woodland. About and hour later she went home for the night with the bodies in the car, next day on 26 April, she brought the bodies to an abandoned warehouse near the city and set fire to the building. and police interrogated her leading to her full confession, say detectives. ‘I couldn’t provide for my children,’ she told officers, blaming money problems for her actions. This entry was posted in Overseas News by Mera Mirpur. Bookmark the permalink.